Helga Edwald arrived at Allegheny College in pursuit of a bachelor’s degree in English. 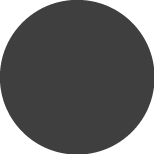 But when the native of Iceland graduated in 1983, she accepted her degree in environmental science. “I took one course with Sam Harrison and that was it. He really influenced my life. I changed my major to environmental science,” Edwald told an Introduction to Environmental Science class at Allegheny while she was visiting campus during the fall semester. She was referring to Professor Sam Harrison (pictured below with Edwald), a 1963 Allegheny graduate who taught at the College from 1970 to 1989. “In retrospect, Helga's decision in 1981 to complete an aquatic environments major at Allegheny added a bright, new dimension to the College's then barely decade-old interdisciplinary environmental science program,” Harrison said. Edwald’s Allegheny experience has led to a passion for environmental activism in her native land, a geothermal outpost about the size of the state of Ohio. Iceland is located along the North Atlantic Ridge, southeast of Greenland, and has a population of about 330,000 hearty souls. 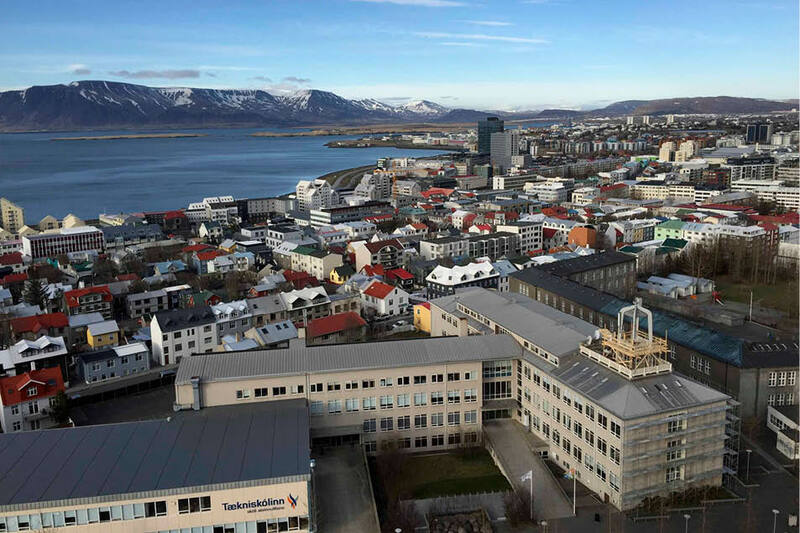 Its capital is Reykjavik, pictured below. 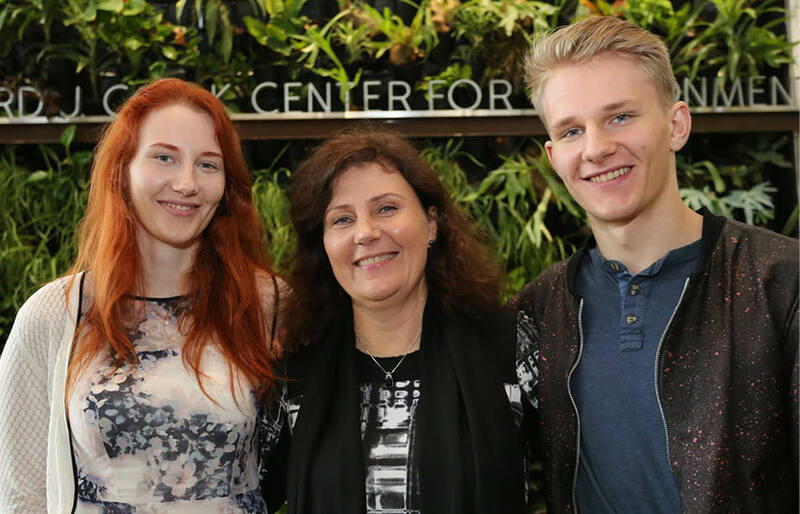 The tourism industry is one of the fastest growing industries in Iceland, so protecting Iceland’s natural resources is of the utmost importance, said Edwald, who is the College’s only Icelandic alumna. The country also gets more than 70 percent of its energy from renewable resources, including geothermal and hydroelectric power, so conservation and preservation of those resources is very important, she said. 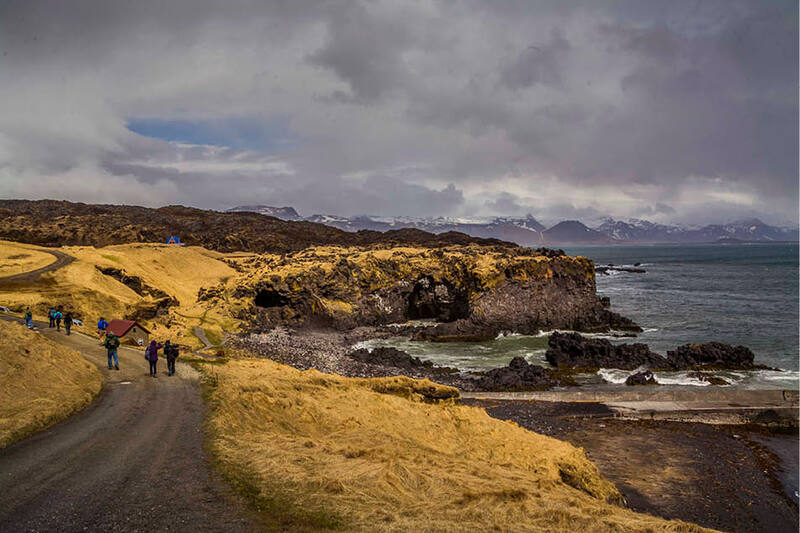 More than 1 million tourists visit Iceland every year, and most of them are interested in seeing the pristine vistas outside Reykjavik. There are stunning glaciers, volcanic edifices and hot springs to lure visitors. 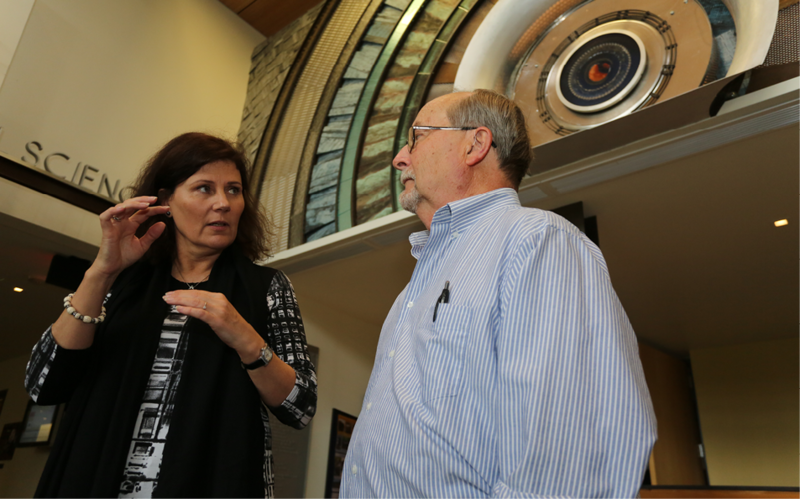 In fact, in May 2015, a group of Allegheny faculty and staff visited Iceland for 12 days. 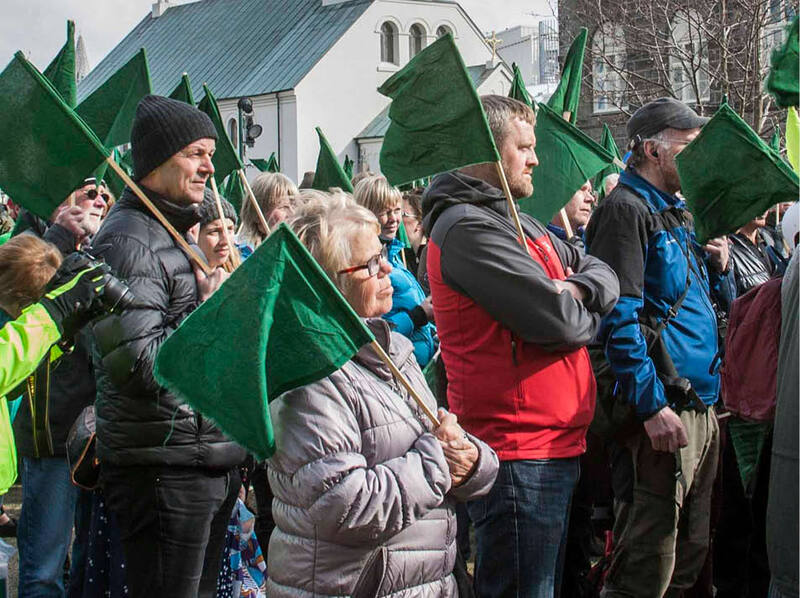 One of the group’s first stops after being greeted at the hotel by Edwald was an environmental rally, pictured below, outside the Icelandic Parliament in the capital. “The protest was about a proposal made by the Parliament’s Industrial Affairs Committee to transfer four additional power plant options from the on-hold category to the energy-utilization category of the Master Plan for Nature Protection and Energy Utilization,” Edwald said. The master plan is a tool to reconcile the often competing interests of nature conservation and energy utilization on a national scale and at the earliest planning stages. Edwald’s interest in the environment has led to a multi-faceted career in medicine and as a medical translator since she speaks four Nordic languages and English fluently. “I’ve been interested in the impact humans have on the environment, so for me, it’s been a natural career choice to study the environment’s impact on humans. It’s like two branches of the same tree,” she said. After graduating from Allegheny, Edwald returned to Iceland and acquired teacher’s credentials at the University of Iceland. 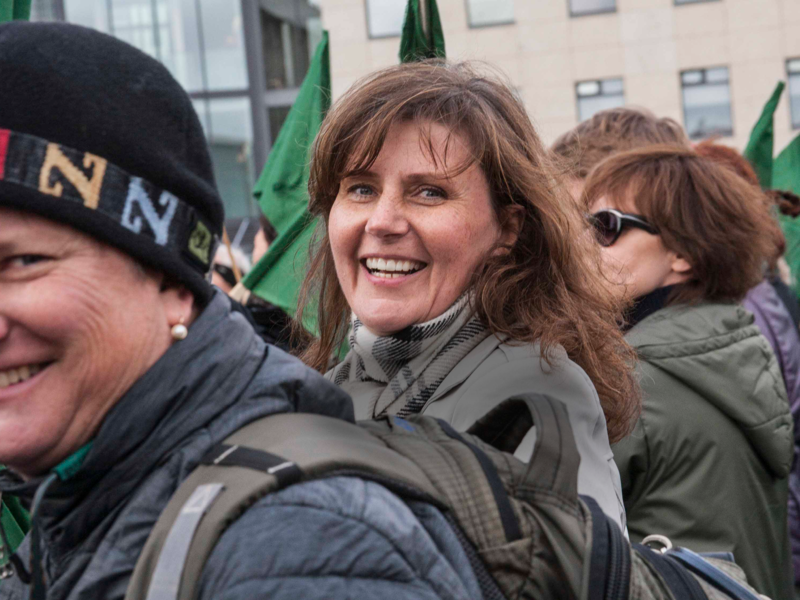 She taught at the Iceland University of Education, crafting her own course, “Developing Curriculum on Environmental Issues for the Elementary School.” She also conducted courses for rangers in national parks and nature reserves on how to educate the public in national parks and nature reserves. Edwald credits her Allegheny experience with the success she has enjoyed later in life, both professionally and personally. Besides developing an interest in environmental science, what is Edwald’s most vivid memory of her time on campus? “I’ve been interested in the impact humans have on the environment, so for me, [medicine] has been a natural career choice to study the environment’s impact on humans. It’s like two branches of the same tree."